My Secret Tip- How to Clean Vinyl Floors – Easily! How to Clean Vinyl Floors Easily! Well, I have to say this post is a little embarrassing, however this is such a great tip that I just can’t keep it to myself! We’ve been in our home for close to 9 years, we bought the house new, from the builder, and didn’t have the budget for expensive flooring in the kitchen, like wood or tile. So the best we could do was to get an upgraded vinyl. I really liked this floor in the beginning, but over the years it got harder and harder to keep it clean. The dirt was really ground into the… pores? … crevices maybe? … of the vinyl, and it looked filthy and nasty! Here you can see how disgusting it was! I have to say that I’m my defense, I have a cleaning service come in and mop my kitchen floor twice a month, and they have done this for years. There have been at least 5 or 6 different ladies from the service that have cleaned it, and each year it got worse, no matter how hard they tried! So it wasn’t just my sad lack of cleaning skills, or at least not in this case! Anyway, one of my girlfriends told me about something that she used on her vinyl floors that worked like a charm. I tried it out on the vinyl tile above and was surprised at how easily it removed the grime! Want to know what it is? Here’s the secret! It’s this surprising product HERE that you may already have in your house, but probably never thought about using on your Kitchen floor!! How crazy is that?!! I was absolutely floored (no pun intended) when I saw how well, and how easily it lifted that grime right up! Make sure you scroll all the way down to see how clean the floor looks after. And read all of the comments at the bottom of the page, left by other people that experienced the same miraculous transformation on their floors too. Here’s my step daughter, (aka Cinderella,) moping the floor. Yes, that’s right… I’m part Fairy God Mother.. part Evil Step Mother! haha! Actually my husband made her mop it, in order to work off the cost of a speeding ticket. I added the Pumpkin to the photo just to drive the Cinderella part home! Anyway, back to the floor! All we did was spray the Scrubbing Bubbles onto the floor, working on a few sections at a time. Make sure the foam covers the vinyl pretty evenly and wait about a minute, or so, for it to work it’s magic. Then use a wet mop to wipe up the grime. We have a fairly large kitchen, so it took about 3 cans to do the whole thing. It’s pretty amazing how it just lifts the grime right off of the vinyl! You can really see how much dirt came up, in this photo. We could have made mud pies right there in the kitchen! Yuck! Ta da! It’s like a brand new floor again! We actually did this a few months ago and it still looks great, so you wouldn’t have to do this every time you mop, only every now and again if you see a build up of dirt. This flooring has a light marble effect to it, in gray, so what you see on the photo above is not dirt, it’s the marbled pattern. I can’t tell you how happy I am with my floor now! I thought I was going to have to replace it, but now I don’t have too.Yay! Let me know if you try this, I think you’ll be surprised at how easy it is! P.S. I was NOT paid to do this post and I bought my own cans of Scrubbing Bubbles, just wanted to share this awesome tip! 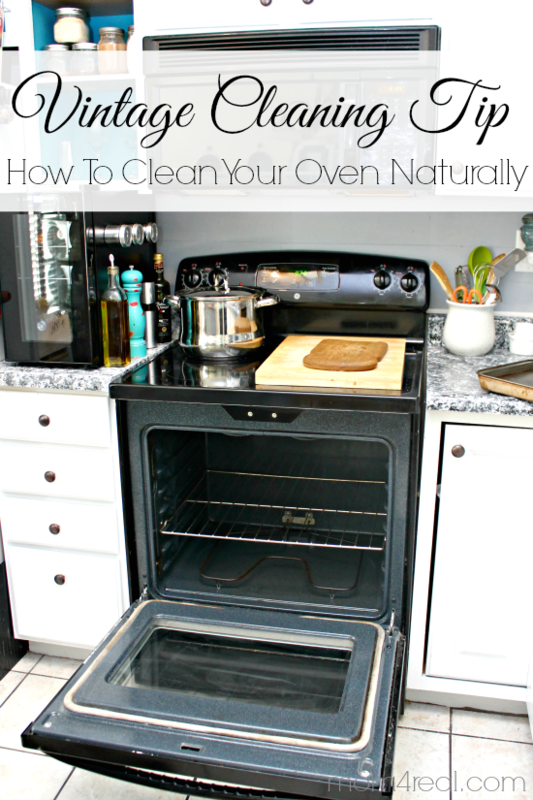 And How to Clean your Oven Naturally HERE. Oh, I love posts like this–one that gives a simple solution to a common problem. Thank you. I might need to stock up on Scrubbing Bubbles! Thanks Kristi! I’m glad you found it useful! so this does not harm the finish in any way? It didn’t on my floor, but I would advise testing in a corner or inconspicuous spot. My floor was vinyl. Pretty sure it would destroy the factory finish, yes. I bought a sheet vinyl floor for the bathroom when we built about 10 years ago. I have the same problem so very happy to hear of your solution. Many thanks for sharing. I love this I can’t wait to try it the floor looks just like mine . I mop it all the time and always looked the same. I’ll be buying bubbles next time I’m in town. Maybe make a speacl trip??? Didn’t touch my vynl floor. Looking for something super strong , very stubborn imbeded stains. Scrubby Bubbles is AWESOME for cleaning window screens and aluminum blinds too. Just take them into the shower, give them a good spray, wait five minutes and rinse ! Perfectly clean !! Works great on car tires too, but avoid spraying the paint on your car. Oh thats a great tip thanks! Thanks Jitzy!! That is a great tip! I discovered this last year out of sheer frustration at trying everything to get the grime off of a mostly white vinyl floor. When I let the bubbles sit the foam turned grey – yuck – but showed it was working. It’s labour intensive though – especially the rinsing part. I spray on vinegar and water and use a mop bucket to rinse, but still wish there was an easier way to clean up the foam. ANy ideas? I clean up the foam with old dry towels and then I rinse with water or vinegar water. I just moved into an apt an the kitchen had super dirty floors. It should be marbled gray and white but most look almost all dark gray. I can’t stand it. I 1st tried Scrubbing Bubbles but not the foam. It’s Bleach 5 in 1 all purpose cleaner. Do you think using the foam makes a big difference? When I 1st tried it I only used paper towels rather then a mop or spònge and it really didn’t work all that great. But, I just learned that Apple cider vinegar is great for cleaning vinyl floors. So I wondered if using Scrubbing Bubbles 1st and then rinse with the Apple cider vinegar would do the trick. I’m trying to find a simple yet productive cleaner because the area I have to clean is huge. Any suggestions? I have only used the Scrubbing Bubbles foam and it worked great. I like your idea of the Apple Cider Vinegar rinse, it is worth a try. Good luck to you! Once I was ready to clean the foam. I would rinse the floor with warm water, to dilute the foam and then use my wet shop vac. Then I did a simple mop up. Oh yea Kathy!! So happy to hear that!! Your floors look marvelous, darling!! I use it on my shower tile and glass door and windows and I love it, as well. I have never used it on lanoleum. Great tip. Thanks Laura! I didn’t know you can use it on Windows! Thank you! Though I hate cleaning, I can’t wait to try! You’re welcome Abbe! I hate cleaning too, but this was pretty cool to see! I use Scrubbing Bubbles on mini-blinds, woodwork, and inside doors. The stuff is great! Thanks Kay! I love that you all have tips for even more uses for this stuff! Where do you buy these bubbles from? Thanks Dona! I’m learning a lot from reading these comments too! PS – Not entirely on topic, but: I do love that a parent is making a child “work off” their traffic ticket. So often, parents just shrug it off. But really, it will not only help her be more responsible, but also SAFER, because she’s paid a “price” and she’ll probably be more careful. Sorry for the soapbox. Thank you thank you thank you !! Our vinyl floors need help also. I too, am at the point of “do we replace them, there MUST be a way to get them truly clean.” You just saved us a bundle!! I also like your parenting idea. We did the “tough love” route a time or two also. Now our grown child says it was the best thing we ever did! You’re welcome Nancy! It is a lot cheaper to get the Scrubbing Bubbles, than to replace the floor! I’m so glad this tip helped! can this be used on “rough textured” tile? Our church kitchen has this and it never seems clean, no matter what we do. thanks. our kids were raised on actions have consequences. they are really responsible and hard working adults now. we’re glad we kept our rules in place. Hi Gena, I would give it a try, I’m sure it can’t hurt! You could spot test it in a little corner to see first. Yes, give it a try Carol! I hope it works for you the way it did for me! Thanks for this great tip. The floors look like new! I’m trying this because my nasty cheap floor will not come clean! And I wonder if the cheaper off brand works the same, I have not tried this product in years. I’ve cleaned blinds the hard way too, but according to your readers I don’t need to again! THANKS! You’re welcome Pretty Purple! Happy cleaning!! Looks great Karen. Do you have a tip for painting a linoleum floor, preferably white. Nowadays it is all so expensive, I would prefer to recycle it but or it is possible, that’s the question. Hi Ellen, I know it can be done! Although I haven’t tried myself. You might want to check out Hometalk.com they have lots of tips on those kinds of things over there. Also, if you don’t find it, you can ask a question there and many times professionals will answer with free advice! Thank you so much Karen for the link. I’ll let you know when I’ve had response. Great idea! I have the same problem with my vinyl flooring. I wonder, though, if the chemical would eat up the vinyl surface, creating pits in the vinyl. Then the floor would get more dirty faster after the treatment. I’ve been using it for about 20 years on my floor and the answer to your question is, NO, it does’t harm the vinyl floor. Thanks Deb!! That’s really good to know! I red it today and my floor in my kitchen looks knew. Could not believe how clean it came . we use scrubbing bubbles for spot cleaning the carpet, also. the foaming action lifts dirt from carpet as well. What?!! That’s awesome! Thanks Willow! WONDERFUL IDEA! I HAVE BEEN LOOKING FOR SOMETHING TO CLEAN OUT TEXTURED BATHROOM FLOOR.SOUNDS GREAT! Great idea! I want the black and white flooring in my kitchen but have been hesitating because I knew it would be hard to keep clean. Now I will definitely get it! Thanks. I have scrubbed this floor with everything I could think of. I have before and after pictures that even amaze me after trying your instructions! That’s great lizziebetliz! I’m so glad it worked well for you too! Excellent idea! Here in Romania we don’t have the Scrubbing Bubbles product, but I think I know a similar one. Brilliant! And the other tips – the blinds, especially – are absolutely great. You are a true Fairy! Thanks Dana! Can you report back with the name of the product, after you try it? I’m sure my other European readers would want to know! Thank you Karen! I am so trying this! I clean my floors all the time, but they sure don’t look like it! Maybe now they will! Can you use it on tile floors? I would think so given that you can use it on tile in your bathroom but want to be sure! Thanks! I have used this product in the grimy shower pan (one piece unit) and found it worked amazingly well. I will try it on the floor! I have the same vinyl and I love it! It looks nasty no matter how much I mop it. I will try this for sure! I use it all over my house for tough cleaning jobs. (like my smooth cook top) I just wish it was not so $$$ as I like to find frugal ways to do everything. What kind of paint on walls? Will this clean flat paint? I’m so excited about this. going to buy some tomorrow and try it. Thanks for the tip! I never had a try on these scrubbing bubbles…I only use Bona Tile & Laminate Cleaner in cleaning my floor and tiles…It makes both the everyday cleaning and the cleaning of dirty floors easy. will it work on rubber tile? It’s my kitchen floor. Scrubbing Bubbles also works great to get hair spray off your bathroom floor. Use the same method as above and it eats away at the sticky dirty mess! This is an awesome comment! I have been working so hard at getting hairspray off my floor and I’m definitely getting scrubbin bubbles now that I read this. Thank you! Thanks I will try this soon! Is it safe for pets and kids? I inherited some nasty vinyl bathroom floors, and you changed my life. Still do not like the floors, but at least now they are clean. Thank you thank you thank you! Wow! 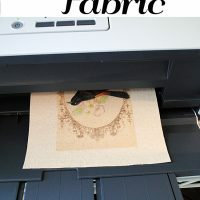 I’m SO thrilled to have found your blog with this FABULOUS tip. I moved into a new apartment last October and the owners had just installed new vinyl floors, black and white squares EXACTLY like the ones in your photo. I tried so many non-toxic options, including hot water and vinegar, but nothing was getting the grime off of the floor, especially the white squares. It was literally driving me crazy! I’m halfway finished with the bathroom, hallway and kitchen and just had to write and THANK YOU for this amazing tip. Your tip totally saved my floors in the short sale home we just bought – they were awful TERRIBLE, way worse than just everyday use. But a few cans of scrubbing bubbles and adding an extra step of scrubbing the heck out of it with a brush, you would not believe the difference! I did a mop with mop and glow afterwards too to restore some of it’s lost shine. 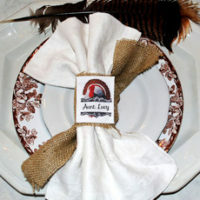 I just posted photos on my blog but I can not thank you enough! First awesome vintage graphics and now you rescue my vinyl, you are magical!! Thank you so much for this tip. 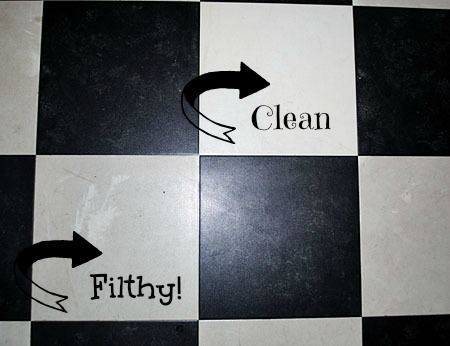 I am going to try this the next time my large floor area needs the crevices and faux grout areas cleaned. Far too much time spent using sos pads and elbow grease already! Omg I just read this article this morning I went out for me a can to try and tried just 2 tiles by my stove which were the worst and in a matter of 5 seconds it was gone! Best thing ever! I been trying to clean my floors like this since I moved in my apartment in may and nothing worked! I’ve been using this product on everything lately. Know where else it works awesome? The top of the stove. 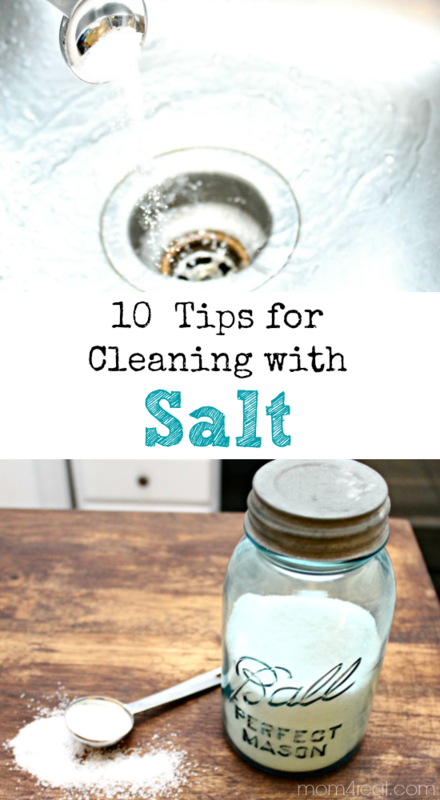 I spray it on at night during our nightly clean up, load the dishwasher than wipe the stove top down with a sponge. They make a kitchen one but I just get the one kind and also use it to clean my bathroom top to bottom. I always get the 2 pack and keep a can in the kitchen and bathroom. Awesome product. Just tried this on my nasty basement floors in my office and it worked amazing! I used a magic eraser for a little extra muscle and it worked great. I couldn’t believe how much dirt I picked up on that magic eraser. It was pretty gross! Thank you so much! Karen, I’m going to try using the Scrubbing Bubbles on my rental property vinyl floors. I am preparing the house to sell and my past renters did not take care of the newly installed floors. They are filthy and i didn’t help by dropping paint splatters in every room. I doubt that the scrubbing bubbles will get the paint up but the filth I’m anxious to see how well it will clean it up. P.S. i used to know a Karen Watson in Tulsa, Ok are you her? This post has changed my life! I used to just not look down at the floor….now I can again. So freeing! Seriously, I wish I had known about this years ago. Thank you! I usually never go on the net. But I was at my wits end with this floor. I tried many different cleaners. I was ready to strip the church floor until I got to your sight . I did what u said but I waited 2 minutes and a paint scraper(19 years of grime) . The grime came out. Tomorrow I’m going to place a large order of this stuff. Thanks a million! 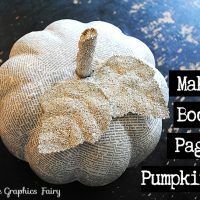 I hadn’t thought of this, but from looking at all the posts, I’m trying it this weekend! We went our little house and it was built in the late 70’s. There is one little area that just won’t come clean. I can’t wait to clean, for once! LOL! Thank you so much. I’m very glad I came across this site and will return for more tips! OMG!! I was searching for something to clean the vinyl floors of an old apartment I just moved into. Everything I was looking at was much more expensive than I wanted to pay. I came across this post and decided to read all the post (all were positive). So I went out Friday night and purchased 4 cans of scrubbing bubbles. (hallway & 2 rooms). I never write post, however I need to first thank you for this amazing suggestion and let anyone who needs to clean their vinly floor or remove spots from carpet. Don’t purchase anything other than scrubbing bubbles. My floors look amazing and it also removed a horrible stain on the carpet. I will always keep srubbing bubbles in stock in my cleaning supplies. Again, Thank you so much! Happy with Clean Floors in MD!! Gotta say that this was one fantastic, really works tip. I was at wit’s end trying to get the built up grunge off my linoleum. I thought I’d have to replace it. But the Scrubbing Bubbles actually worked. I let it set for several minutes and then used an Ocello scrub sponge….and it all came off! My floor changed from dark and dirty-looking to like new. Oh, and it smelled good, too, while I was cleaning it! Thank you so much! Really an useful list of tips. Great to go through it. Would like to say thanks for sharing. This works great! So glad I was finally able to get the dirt out of the crevices in our kitchen floor. Not sure how you learned that this works, but am sure glad you passed the secret on! Thank you, thank you, thank you! Thank you, thank you! I had just recently bought a double pack of Scrubbing Bubbles at the Family Dollar store so tried it right away. You have saved me- Thank You! Screens and windows next… back to the dollar store too! I tried this today on the vinyl floor in my kitchen! My floor is actually white for the first time since we bought the house! I have tried almost everything and this is the only thing that works! The fact that it is SO easy and quick is a HUGE plus. Thank you, thank you, THANK YOU for this tip!! and find this kind of thing an enjoyable read. Thank you! Thank you! Thank you! Finally, after years of searching, something that actually worked to clean my textured vinyl floors. The scrubbing bubbles + a magic eraser, and absolutely no elbow grease involved! My floors look as good as they did the day we moved in, almost 10 years ago. Hey Karen, I was wondering whether I should get black and white checkered vinyl. I love the “look” but I’m not sure about the upkeep. I have the sample here and the white square already looks smudgy. 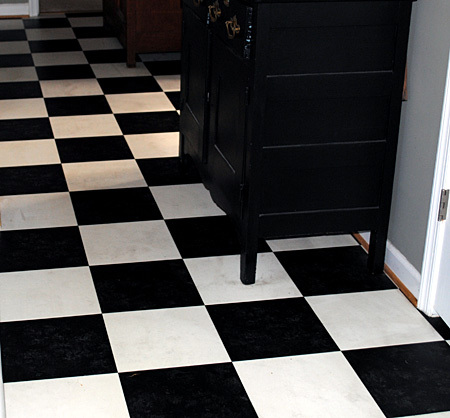 Would you have the black and white floors again or would you pick up something different? Thank you in advance. I have the same exact flooring as you do, Karen, and I agree it is hard to get clean. I like the marble effect for the simple reason of NOT showing dirt, BUT, it is hard to get it back to the original gleam. I was even going to get on my hands and knees to hand scrub my floor. Giving this trick a whirl. Thanks. This is a very simple and cool idea to keep the vinyl floor clean. Thanks for sharing cleaning tips. OMG you are a life saver!! want to cry tears of joy! My kitchen floor is white vinyl and I mop and its like I have not moppend in years. I could not find anything that would clean it and ive tried amonia and clorox, but they did not compare to the scrubbing bubbles!! Who would have thought something I had for my shower could work on my ugly floor!! Thank you so much for this tip you saved my life!! Yay!! I’m so glad it worked for you too Kim! No problem Stacy! Enjoy your nice clean floors! Well i have tried EVERYTHING from Industrail , to vinegar and baking soda ,to hand and knees with Mr eraser ,Javex I tried it all I am going out to buy 22 can of mr bubbles hope it works. Good luck Peggy! I think you’ll be surprised at how great it works!! And you don’t need 22 cans, probably 2 or 3 will be fine even if your floor is large. Thanks for the great tip. I’ve tried scrubbing on my hands and knees so this will be great. Once your floor is clean apply something called Quick Shine Multi Surface Floor Finish by Holloway House. Use a soft flat mop duster (shaped like a Swiffer) to apply. Then you can just un-velcro and wash when done. Put a coat on and then let dry. I usually apply a couple of coats. You need to put on carefully so it doesn’t streak. Let it dry completely before walking on it. (About a hour). I use this on my hardwood too. It will make your floors really shine and put a protective finish on them. I live in an older home and the floors (hardwood) was really marred and dull. This really changed the way they look. People are always asking me how I keep my floors so nice and shiny. This is how. I found this product from an older gentleman that had a cleaning company for years. He used this an swore by it. Give it a try and see if it works for you. Thanks for the tip Cindy! I looked up a lot of solutions to tracked in kitchen grime on vinyl flooring, and this is the only one that worked! Thanks a million for posting this. Thanks John! I’m glad it worked for you too! Thank you, thank you, thank you! I’m selling my house and the vinyl floors have been the bane of my existence. This was so easy and made them look presentable. Once again. thank you! I have the exact same flooring! I will definitely be doing this. Thank you!! Oh………….my……….gawd!!!! This is the only thing that works! I am sooo tired of one my hands and knees (even with a shark steam mop) to really get these floors shined up. I AM SOOO EXCITED!! It isn’t even dry yet, and here I am posting results!! And I also got the Holloway House floor shine suggested above to try to maintain this beautiful clean!!!! Woohoo! That’s awesome Lois! Enjoy your shiny clean floors! I have a commercial use and of course the floor is filthy. I did put wax on the floor to make it easier to clean when I did clean it. Not so sure how that worked, but, my question is, will the scrubbing bubbles take the wax off also? Thanks for your response. Hi Steve, I’m sorry but I have no idea. I’ve never had a waxed floor so I’ve not had the opportunity to test that out. You may want to test it out in a small inconspicuous spot before trying it on the whole floor. Anyone know if this is safe for pets once the floor is dry? Karen, OMG…I hope this let’s me leave a comment as I have never commented on a blog before…People LISTEN to her..I have been in my kitchen for hours..first used my professional steamer..then baking soda and vinegar…water an bleach…yeah,,it was getting the steamer paid and the mop dirty but the floor still l looked gringy and dirty..I went and got my scrubbing bubble out of the bathroom with an aching back and neck from hours of mopping and I’ll be son of a gun..CLEAN…..THANK YOU so much..I was just about in tears as nothing was getting that built in dirt out…but thanks to you all of those dirty spots that nothing was getting up are gone…..WOW.. Yay!! Thank you so much for the super nice comment Beth! I’m so happy this worked for you and now you can just do it the easy way the next time, with out all of the scrubbing and steaming! Enjoy your clean shiny floor! Similar story to Beth’s. I cannot thank you enough for sharing this tip! I rent an ancient house with worn out vinyl and I have scrubbed myself sick. I was sceptical but knew I had nothing to lose. This is the first time I have ever felt like the kitchen floor is truly clean. Decades of ground-in grime lifted in about an hour and a half. My sincerest thanks. You saved my kitchen floor! Thank you! I thought I was going to have to replace it and now it looks brand new. Whew! I am.not a person who posts either but I wanted to validate and share. I have vinyl tiles in my office that are a challenge to keep a clean appearance despite daily mopping. The only time the floor looks good Is after it is stripped. I used the scrubbing bubbles and my God it made a big difference. And no…I didn’t get paid to say it and yes I bought my own scrubbing bubbles. I have a before and after pic but can’t figure out how to post it but trust me it is ridiculous the difference. Thanks Kia, I’m so glad my little tip helped you too!! The floor in our kitchen is vinyl too and after all our holiday guests, it really needs a good clean.Through the years we’ve changed the vinyl flooring twice (the right moment for changing the flooring type never comes) and this was my only decision for fighting all that filth. Your idea seems to be the answer of all my questions (at least for now). I’m definitely trying this product. Thank you for sharing your experience and have a great year! I tried this on my bathroom. AMAZING! Thank you so much for the tip! Best tip ever! The floor in our community center always looked disgusting. We just did a sample area and I am thrilled. We have tried everything and as a non-profit organization with very limited funds, I couldn’t be happier. Thank you! Thanks Karen! I will join the growing voice of appreciation about your tip! I have a huge area in my foyer, hallways and kitchen, eat-in-dining area with a vinyl tile faux white marble flooring! I was just researching floor scrubbers because my back can no longer tolerate getting on my hands and knees to scrub this floor! Your advise worked like a charm – the Scrubbing Bubbles lifted dirt that I could no longer notice since the floor was uniformly dingy! Amazing results in two sections that I trialed it on today. Next trial will be on an entry way carpet that has a nasty spot on it that other cleaners have not lifted. That’s great Donna, I love hearing that! Thanks for letting me know and happy cleaning! Wow! You really changed lives here : ) My vinyl floor is so gross, was planning on getting on my hands and knees with a scrub brush til I saw this. I’m going to try this ASAP!!! Great Tip Karen! Enjoy your clean floor! I used scrubbing bubbles and mopped with my shark steam cleaner on my kitchen vinyl but didn’t get the same results. My husbands boots stuck to the floor, my flip flops did the same. It was like glue. I tried to steam again thinking I needed to rinse the soap off. Still having the same issue. The shine is gone and can’t quit sticking to the floor. I tried rinsing it 3 times. Now we leave foot prints wherever we walk on it. What did info wrong?? Hi Kathy, I’ve never used this method with a steam cleaner, that was not part of my instructions I’m afraid! It comes off so easily all on it’s own and works so perfectly, there’s no need to use any tools with it. It sounds like adding the steam is what caused the issue on the floor. I would try mopping it, with water, and NO steam and see if that corrects it.. Other than that I don’t know what to tell you, I can only vouch for the process the way that I did it and wrote about it. I don’t know anything about those steam cleaners. You may want to give the manufacturer a call, if the water mop up doesn’t do the trick. OMG! My linoleum floors look new after 8 years of ground in mud and dirt from my dog and husband! I could never find ANYTHING that would get the dirt out of the crevices! Sprayed, waited 5 min, wiped with a sponge, and scrubbed with a hard bristle brush to get the crevices and its like NEW! Before I just tried not to look! THANK YOU! Yay! That’s awesome Megan! It’s those crevices that are the problem, this is the only product that I have found that get’s into those crevices! Did I read somewhere that this works on wood floors also? Hi Wayne, No, I would NOT try it on wood!! I think it would be too harsh. Thank you so much! I have tried for years with many different products, and so have cleaning services, to no avail. I was ready to get a new porcelain floor. This got the floor clean in minutes. Quick, cheap, easy! Absolutely love Scrubbing Bubbles. Have used that to clean silk lamp shades, vinyl window frames, my kitchen sink. When we bought our house, the copper stove hood was covered in green grease and carbon. It came down in 6 pieces which I took to the basement and sprayed with oven cleaner and left overnight. The next day I just steel wool cleaning pad and ended up with shiny copper penny clean. A light spitz with sccrubbling bubbles restored the desirable patina and now I use that to keep it clean. Great stuff. Talk about timing. Clutter under the bathroom sink became so unbearable today I organized and emptied. There were two rusting spray cans and a spray bottle of that stuff. I thought hard about throwing it away, it’s old, I never use it but it cost money. So two hours later I Google “how to efficiently clean filthy vinyl floors” and here I am. The hoarder in me pays off. Thanks Walt, good for you! We have vinyl tile in our kitchen, and I’m always looking for new ways to clean it thanks to a rowdy puppy. I’ll definitely have to give this a try! Thanks for sharing the tips. I just did my entrance way and wow it works amazing. I mean, really clean. I rinsed and rinsed and still had product in the mop each time I rinsed. Maybe I used to much? I will do the kitchen next, but first I want to make sure the floor isnt sticky like the one gal said above. How many times do you rince it? I just did my entrance way and wow it works amazing. I mean, really clean. I rinsed and rinsed and still had product in the mop each time I rinsed. Maybe I used too much? I will do the kitchen next, but first I want to make sure the floor isnt sticky like the one gal said above. How many times do you rince it? Thank you so very much for this info! I did my kitchen tonight and it looks fabulous! I can’t believe how clean it is! I have tried so many things but this really worked with a little help from a Mr. Clean Eraser. Amazing. I tried all sorts of things on my 50 year old bathroom floor using lots of elbow grease. This worked ‘so’ much better than anything else. The bubbles did the job. Wonderful. Yea, so glad that it worked for you Kathryn!! Dear Newly-Made-Friend — TRIED AND TRUE — I have one of those vinyl floors, washed or not, looks exactly the same — SOOOOOOOOO GLAD I ran across your post about the Scrubbing Bubbles — I washed, rinsed and let my floor dry in sections — the difference between the washed and unwashed was ridiculously unbelievable — my floor has NEVER looked that clean — THANK YOU SO MUCH for the tip! That is wonderful Lana!! So happy you found us!!! Wow. So excited to come across this post/blog! Going to give this a try – was going to ask my landlord to replace the kitchen floor or spend some cash at HomeDepot. It’s embarrassing. Thanks you, everyone for your comments. I wish I could think of something extraordinary to say……., OMG!!!! Apt. floor in an old mill, vinyl beige tiles with grooves. Six years of trying to get it clean. We were first ones to rent this apt., and there only 2 adults here. We had a build up of the strangest grey on our floor. There are trains behind us, so it might be that, I just know it was impossible to clean. The floor in the middle, was the color of cement. And I did not think of a picture, till all that was gone ! This is actually the only thing I have tried from the net, that actually worked! Good luck all, just try….we all might not be crazy. Thanks Anita! I’m so happy you were able to get them clean…yea! Thank you for sharing this tip. I needed a process to clean some extremely dirty floors. The longer the solution soaked, the less scrubbing I did. The product worked like a charm! Yea Valencia! So happy it worked for you, thanks so much for sharing 🙂 Happy New Year! I can’t believe how well this worked. Two floors down and one to go. Thank You! I’m not sure Dana, but give it a try and see? Good luck! When cleaning your vinyl floors DO NOT Use Acid. While acid will quickly rid stains and dirt, it will also break down the quality of the vinyl easily. Thanks for sharing such a wonderful article. 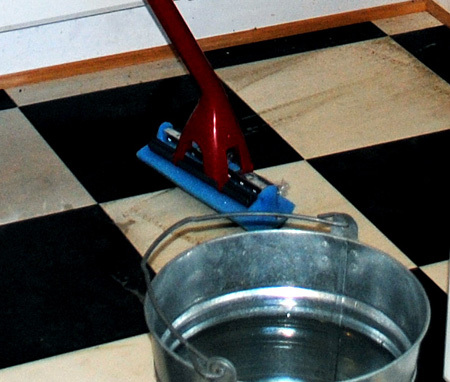 One of the best cleansers for vinyl flooring is apple cider vinegar. The acidity in the vinegar helps remove dirt and grime without leaving a buildup of soap or wax. Simply mix one cup of cider vinegar with a gallon of hot water and use a damp mop to clean, rinsing the mop frequently with hot water. Thanks Cheryl! I agree Apple Cider Vinegar is amazing for so many things! Well, God Bless America!!! It worked like a charm! Our floor isn’t even a year old yet, but no matter how many times we mopped, it would still look dirty. Thank you for finding the perfect solution. I also put in a claim with the manufacturer. Makes no sense to sell me a floor with an inadequate cleaner. Thanks again! Yea! So happy it worked for you Linda! My wife has been looking into some vinyl floors for the kitchen but wasn’t sure if she could maintain it well. I like that you let the cleaning product soak into the crevices before mopping. I’ll have to pass this along to her. Thanks for the help! 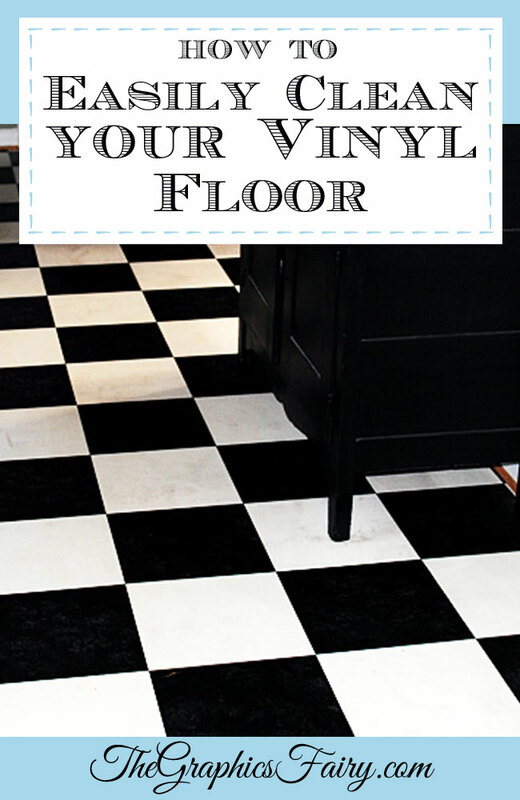 Thanks for the tip but it did nothing for my vinyl floor. I’m so sorry Jane, it has helped so many others 🙁 I hope you find something that works! We cleaned our vinyl floor with some dish soap and a cup of Borax in a bucket of water. Lots of scrubbing required. We might try Scrubbing Bubbles next time. Give it a try Jerry, so many, including myself have had great success 🙂 Good luck! I spent my weekend working on my 23 year old vinyl strip wood look floor and I cannot stop staring at it. It looks brand new. Its been years of three kids, two dogs, built up wax etc., and it looks absolutely amazing. I had no idea until I ready your website. Thank you a million times over!!! I just bought some generic scrubbing bubbles at The Dollar Tree so I could try this on our linoleum floors in our kitchen. We rent and have been in our apartment for a year. The kitchen floor should really be replaced but that is not going to happen anytime soon. My floors are disgusting. I mop, but the grime never comes off. I’ve been searching the internet for some suggestions and came across this post. Anyway, I tried it on a small patch in my kitchen… WOW!!!! What a difference. I sprayed the cleaner on and barely left it for 30 seconds. I was only testing it real quick during my lunch hour. I did not think that it was going to work as well as it did. I did use a magic eraser sponge to wipe off the cleaner. I didn’t use any elbow grease either. I can’t wait to get my floor clean now. Thank you so much for this suggestion. Oh yea Andrea!! I am so glad, I hope you have sparkling clean floors soon!! Scrubbing bubbles also works great to remove the black soot from your fireplace. Stubborn stains may need a little scrubbing with a scrub brush, but it does come off. 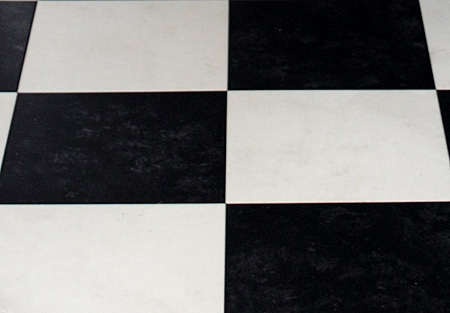 So I have very similar black & white tile kitchen floor that is probably around 30 years old. I just tried this and am 1/2 way through – it’s absolutely amazing! My husband is so impressed. Now we won’t have to replace the floor. Can’t wait to finish and apply the Holloway House Quick Shine to see the final results. Thank you so much for sharing this tip!!! Oh yea Ann Marie!! I am so glad it worked for you, it’s so exciting to finally get it to look good again! I have old white vynl in my kitchen and entry way. I hate it the wife hates it. im glad I saw this im going straight to the cleaning aisle and pick up a few these cans. do I have to strip my floors first before doing this? I believe the last people that lived there didn’t clean it well. No stripping necessary Felix, good luck!! While it kind of worked initially, this trick resulted vinyl floor coming apart a little. OMG, thank you so much! Getting ready to sell my house, and my vinyl grooved floor looks awesome. I used to use tons of magic erasers and do sections at a time. Just used it and the floor hasn’t looked this good in years! We’ve been desperate for a solution for grimy old kitchen vinyl, in the house we rent, that regular mopping, even steam cleaning, hasn’t addressed. It’s been so embarrassing whenever we have visitors. We just tried Scrubbing Bubbles! Wow! Works like a charm! While I can’t say the floor looks like like new, after all it’s I don’t know how many years old, it definitely is sparkling clean. Thanks for the tip! I hope it works. I had backed a backed up sink that spilled all over the floor. The water was nearly black and left a black stain in the sink that I can’t get out with repeated uses of scouring powder/Comet. I hope it works for you too, always did for me, good luck!! This is a little off the subject of cleaning vinyl floors but would like to know how to bring back the shine in worn spots by the kitchen table made by constant rubbing of chairs– after I have done this wonderful cleaning . It really is wonderful! Hi Alice, I am so glad it worked for you 🙂 I am sorry that I do not know how or if that is possible with your worn spots as the finish has probably been worn off? I used SOS pads and magic erasers. I was on my hands and knees for days scrubbing my entire place tile by tile. My body is really sore. Next time I will try this product but hopefully the floors will never get that dirty again. Vinyl floors never again. Oh my gosh Jamila, give this a try, much easier on the back and knees!